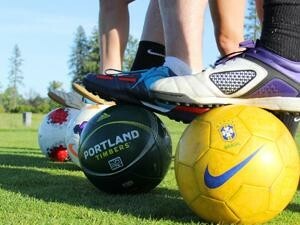 Sah-Hah-Lee Golf Course is excited to be the second course to introduce FootGolf to the beautiful Portland area. It is a hybrid of two of the world’s most popular sports – golf and soccer, and this brand new sport is quickly growing in popularity throughout the United States. Introduced to America by Roberto Ballestrini, FootGolf has captured the attention of the PGA of America. Ted Bishop, President of the PGA, has added a FootGolf layout to one of his courses and sees it as a great opportunity to get new people out to the course. To play, participants use soccer balls on a traditional golf course with 21-inch diameter holes. The rules largely correspond to the rules of golf and uses golf’s basic model including tee boxes, greens, bunkers, hazards, and 18 holes of play. The goal being to kick a soccer ball into a cup using the fewest amount of kicks possible. While the soccer ball doesn’t travel as far in the air as a golf ball, it will roll much farther in the fairways and require players to take into account the undulations, hazards, trees and other challegens of the course. 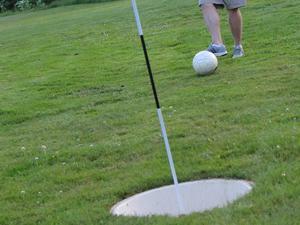 FootGolf at Sah-Hah-Lee was created in conjunction with the rules of the American FootGolf League (AFGL). The sport is played in the traditional format of up to four players per group. Dress code: Cleats are not allowed. Turf shoes or indoor soccer shoes are recommended. Soccer balls are available to rent, however supplies are limited. Bring your own ball if you have one. Footgolf is fun for the whole family. Come and try out the new sport. For more information and available tee times please give us a call at 503-655-9249. FootGolf tee times are currently scheduled for Mondays and Thursdays at select times throughout the day and afternoons beginning at 3pm on Tuesday, Wednesday, Friday, and Saturday. No FootGolf on Sundays at this time. Times may change, so please call the Golfshop for updates!